Many of the stories that we tell our students and the cultural lessons that we share are our part of our collective oral tradition – they belong to all of us. They are of the Earth and we are of the Earth. These stories resonate with us because we have lived them, experienced them first-hand as fellow passengers on this planet. Like stories once passed down for generations and now seldom retold, the sense of intimacy present in these tales can be lost when not repeatedly shared with children. It is essential that we regularly return to this connection, to remind and refresh us all of where we came from and how we are all related – to each other, to the Earth, and the universe. The atoms that fuel the energy of the Sun, that form the water in our seas, that build the cells that scaffold the tallest trees, and allow for our brains to make sense of what we perceive all can be traced back to stardust. They and we are one. 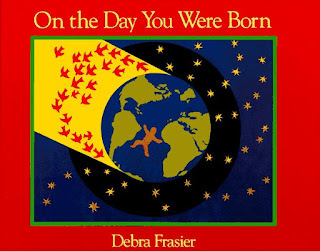 In On the Day You Were Born by Debra Frasier, one’s scientific way of knowing merges with the spiritual. Through gorgeously rendered paper collages and poetic text, the story tells the tale of each human’s journey from within the womb to the world outside – all the while speaking of the patterns and rhythms of nature that have always been. It is an intimate story that connects us again and again to the greater cosmos. On each page there are volumes being said – the words speak like pictures and the illustrations root you to the world. Each conveys just enough to allow for the mind to wonder and make connections. Following the story, there are additional pages that explore and illuminate the science behind each illustration. Each description dovetails nicely with the lessons we share in a Montessori environment: the Universe Story, the Work of Water, the Work of Air, Botany, Zoology, The Coming of People, etc. Children delight and find great comfort in the discovery that the stories we tell and the impressionistic lessons we share are part of the wider collection of knowledge held by others - outside the classroom. On the Day You Were Born balances our inherent desire to highlight the gifts of each individual child, with the strength found in community. Despite the fabulous uniqueness of each one of us, we need to be sure to celebrate each child’s individuality while underscoring the connections that tie us all together. To only do the former, leaving the latter as an afterthought, teaches children just that: that our connections to others and the universe are to be secondary to the “mighty me”. Developmentally this can be a challenge. Children can, at times, struggle with balancing their growing sense of self and independence with meaningful relationships with others. This makes sense for young children, as they are hard at work understanding how to get their needs met first and foremost. Those around them can be seen as either helping that process or hindering it. No matter one’s age, however, in sharing stories like Frasier’s we subtly remind us all that there is more to our lives than meeting our own personal needs and desires. We have a collective history that has relied upon, and a future that now yearns for, our collaboration. Lovely concept... loved to here more about people who have used in the classroom and what reactions you got.